Gifts, toys, stocking stuffers, and all the excitement of the holiday season is in full swing. The last thing you need to stress about is what type of toy to get for your niece, nephew, son, or daughter. After all, you’re probably thinking to yourself they already have a semi-truckload of toys, so what else is really new to get them? We don’t think a parent has ever said, Gee, I wish you didn’t get an educational gift for my child! Nope, never heard it before. This is exactly why Klutz has this season’s must-have educational gifts covered this Christmas. When you want an educational gift that has crystal-clear instructions with a sprinkle of humor, you now have creativity right in your living room. Children love to create, explore, and have hands-on experiences as they grow and learn on their own. Klutz’s educational gifts help them to create these wonderful things while having fun playing with them afterward. What kid wouldn’t enjoy blasting off? First, put their little minds to work while they construct the mobile, air-powered cannon. Don’t worry parents, it comes with an included target so your lamps and T.V. should be safely out of range! Your child will discover and put into practice physics (the projectiles), the workings of pneumatics (similar to a bicycle pump), and everyday working machines that use these similar components using air pressure. Oh, and did we mention your child will be able to practice their sharp shooting skills? You know, incase there’s a zombie invasion! You know that one kid who tends to want to put things in the light socket? This is the STEM kit for them! Introducing a circuitry kit, the special receiver of this gift will get an enlightening combination of five circuit games they’ll be proud to build from scratch. Watch in amazement as they combine actual electronic components and parts to construct an operation game, a Space Loop race, create a quiz show board, and more. With the step-by-step instructions included, possible frustrations that it won’t work are virtually eliminated. In no time they’ll be assembling wires, LED’s, and buzzers to create the game themselves for hours of fun. Next time your child has a sleepover with friends, it’s not the Xbox they will be zoned out on, but rather engaged, competing and not on a digital device! What kid (or adult) doesn’t have a sweet tooth for bubble gum? Instead of wasting your quarters at the entrance of your favorite shopping store, just make your own gumball machine! Your child will have a blast knowing that when they are done, they’ll have a real working gumball machine to sell gumballs to their friends. Not only that, parents, you decide what kind of gumballs your children will enjoy. Whether you want to go all crunchy organic with real fruit juices or just eliminate artificial colorings, it’s up to you. As with all Klutz Kits the special receiver of this gift will have the hassle-free and confusion-free step by step instructions for their machine and other gumball-related experiments using household materials you already have on hand. It’s literally going to be a ball of fun! Educational gifts are just as unique as the children who receive them. Whether you are looking to light up your child’s face with the latest digital gadget or hands-on STEM-based product, it’s going to be a great holiday season! Be sure to enter to win one Circuit Games Kit and check that off your list for that special someone who you know will love the “toy” that is actually an educational gift that will go beyond Christmas morning. Giveaway valid for the continental US only. 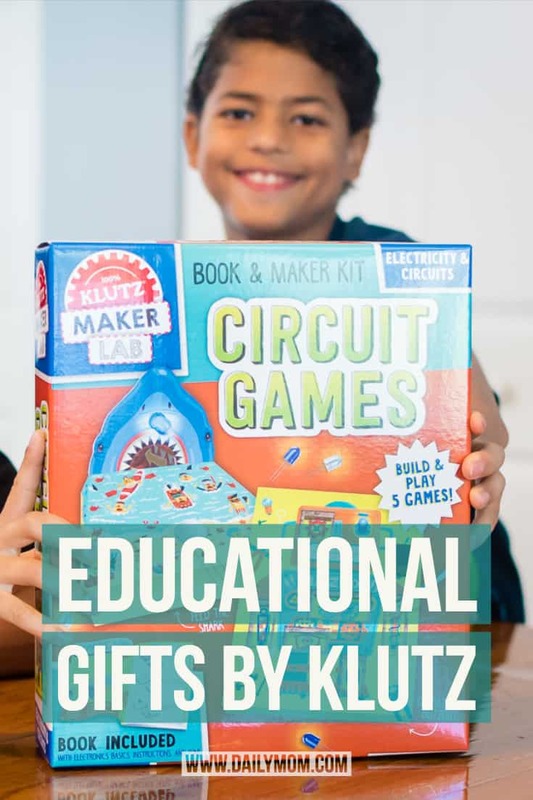 To enter to win a Circuit Activity Kit from Klutz, check out our giveaway or enter below! You might also like: 5 Tips For The Flu & Cold Season To Keep Kids Healthy.